Adorable Red Riding Hood character doll from Moulin Roty. Designed by a long-lasting French toy company. Doll is 14" tall. 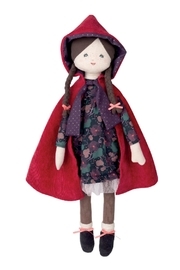 Companion character dolls are the Gentleman Wolf, the Alluring Dame and the Gallant Cat.